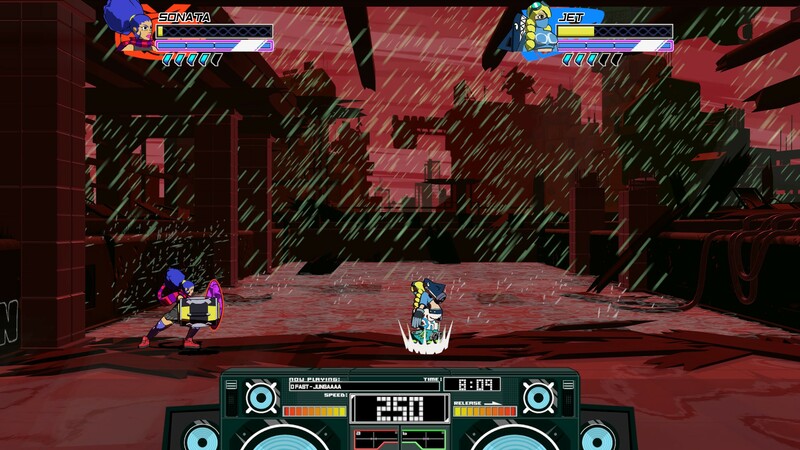 Lethal League Blaze is a springy, frenetic future-sport played by an underground league of robots, skaters, mercenaries and a sentient boombox. Imagine baseball, but then strip away all the parts that don’t involve whacking a ball, replacing them with violent duels between two to four brawlers. In these duels, the baseball is the sole weapon. That might be underselling it. The ball is a relentless, physics-defying missile that, at full force, can almost be everywhere at once. Few other games make hitting things, either balls or people, this immensely satisfying. I get to pretend I’m good at Blaze. With the flick of the stick and the press of a button, I can launch a supersonic, earth-shaking strike that bombards my opponent from every direction. With one hit, the baseball can become a WMD. Like Smash Bros, its closest relative aside from the original Lethal League, it’s a party game. Simple controls and an absence of elaborate combos means you can pick up a controller and just start swinging. Everything orbits the ball, and the player with the most control over it wins. When you smack it, the ball is tagged with your colour and can’t hurt you, but the other player can avoid taking damage by simply smacking the ball back, changing the colour again. It might be a baseball you’re knocking about, but Blaze frequently conjures up tense rallies that are more evocative of racket sports. It’s hypnotic. If you keep hitting that ball back, you’ll stay concussion-free. But you don’t want to get stuck in a rally forever. Ultimately, you’re trying to plant the ball right in your opponent’s smug face. And boy does that feel good. There’s a bit more to landing a hit than just leathering the ball really hard. You’ve got to be sneaky. You could, for instance, bounce the ball off the borders of the arena to get it behind the other player, catching them off-guard. They’re probably not going to just stand there waiting for you, of course, so you’ve got to aim for where you expect them to be, not where they’re currently standing. It requires a lot of split-second tactical manoeuvring as you try to get both ball and opponent in position for your coup de grace. With every strike, the ball picks up speed until it’s moving so fast that there’s a very real concern that it might rip through time and space. At slow speeds, the ball can only do a small amount of damage, but as it gets faster, the prospect of missing it becomes terrifying. At a certain point, it doesn’t matter how much health you’ve got, it will smack you right out of the arena. When the ball reaches cataclysmic speeds, everything starts to shake, the world turns red and I confess that I usually start shouting at that point because bloody hell is it intense. You don’t always want the ball to be tearing across the screen. Sure, a supersonic projectile might knock out your opponent, but it could just as easily be turned on you. To get more control over it, you can give it a little bunt. What’s great about the bunt is that it stops the ball in its tracks but lets it keep its kinetic energy, so when you hit it again, it’s still got some speed. It’s also possible to counter an attack by plucking the ball out of the air and pitching it back, baseball-style. It’s more about manipulating its speed and direction, not just making it go very fast. A slight change in the pattern might be all it takes to put your rival on the back foot. It’s a relief not to have to memorise more move lists. A few straightforward inputs are all you’re going to need to hold in your head, yet you can do so much with them. The tricky part is combining them all in battles where everything happens so quickly that reality itself gets a wee bit wonky. You get some help with this, though. When you connect with a ball that’s going especially fast, for instance, you briefly freeze as all the power swells up. It calls to mind an over-the-top anime brawl, but it also serves a practical purpose by giving both players time to breathe. 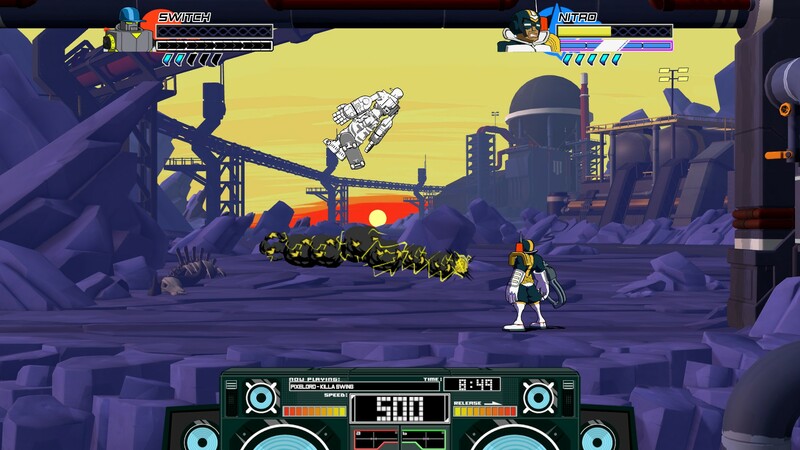 In the middle of a fight, a device can appear that bestows a random power-up not on any player, but the ball. You’ve just got to hit it. Nothing sows chaos like Blaze’s power-ups. Maybe you’ll have to knock about an invisible ball, or perhaps it will become an electrocuting drone that you can directly control or even a rocket that can phase through walls. I’m actually not looking forward to the time when I know how each of them works, as the surprise and confusion is part of the magic. There is one problem, however, which didn’t become clear until I was playing against someone who had a lot less experience. Getting the ball into the power-up device requires a bit of precision and timing, as it’s a moving target, which naturally means that the better player will receive most of the power-ups. It’s an advantage that they don’t need. 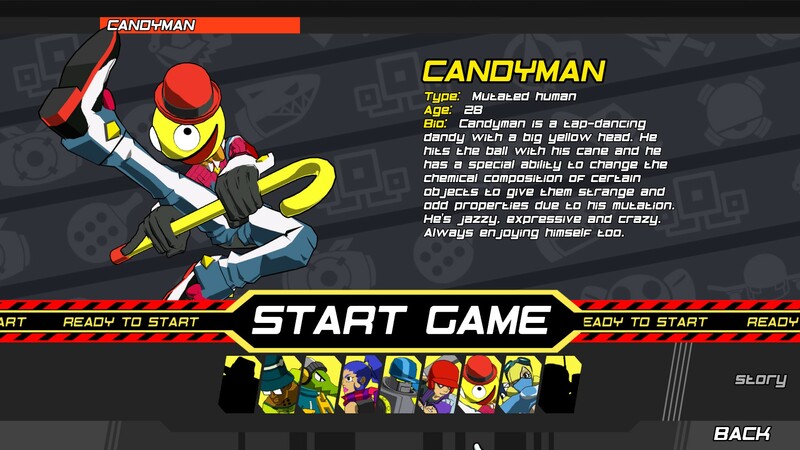 All of Lethal League’s ballplayers return, along with three new prospective champs. Because you don’t need to pore over pages of combos and abilities, there are fewer hurdles to taking a new character for a spin. There’s still quite a bit to get used to, mind. Hitboxes, speed, ball control – they’re all subtly (sometimes significantly) different between characters. I’m rather partial to the robot lads, Switch and Doombox. Switch is a skateboarding robot who deflects the ball with rad tricks and can, impressively, skateboard on the ceiling. He’s wonderful. Doombox is a sentient boombox with anger issues, and he’s an absolute unit. He’s a huge target, but gosh he makes me feel tough. With his jetboots, he’s also surprisingly light on his feet. There are nuances that take time to pick up, but you have easy access to the entire toolbox straight away. Mastery isn’t remotely required for Blaze to simply be a hell of a lot of fun, either. You can ignore the subtleties of parrying and not care about timing special abilities perfectly – that’s fine! It’s still a satisfyingly kinetic, outlandish fighter whether you plan on really digging into it or not. Blaze has more single-player diversions than its predecessor, but the pickings are still a bit slim for the solitary brawler. The very plain arcade mode returns, but this time it’s accompanied by a half-hearted story mode, as well. The story battles are, with only a couple of exceptions, exactly the same as the arcade bouts, but there are also some forgettable vignettes getting in the way. They feel a little extraneous, but you get some easy currency that can be spent on new costumes and stages, as well as a few things that can only be unlocked by finishing them. It’s strange that the unlockable modes like the volleyball variant – sadly, quite bad – only show up in the story once and then never again. They’re playable in online and local multiplayer, but that’s it. The omission is indicative of a single-player experience that’s content with simply existing. Even basic options like tweaking the difficulty are absent. Multiplayer is a different story entirely. 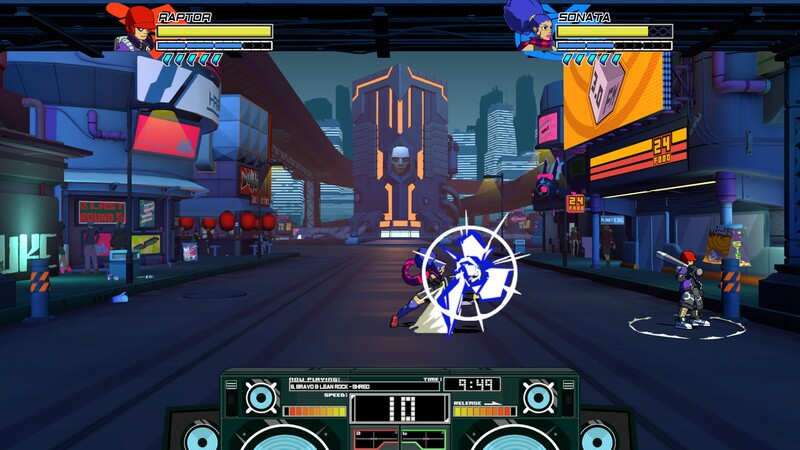 The original Lethal League was right up there with Samurai Gunn and Nidhogg when it came to local multiplayer games, and I fully expect this to replace it. It’s designed to create big moments. The long rally that has everyone on the edge of their seats, waiting for one player to break; the electric power-up to takes out three other players, putting the underdog in the lead; the gentle, slow-moving lob that still somehow wins the match. It demands an audience, really, and I can’t wait to start playing with larger groups. Online multiplayer is a fine substitute in the meantime. Both modes let you customise the matches, tweaking the rules and making big changes like getting rid of the health bar and returning things to the brutal one-hit knockouts of the original game. So far the only issues I’ve encountered have been related to Steam, not Blaze, and otherwise it’s been relatively easy to host and join matches. The illusion that I was any good at Blaze was immediately shattered when I started playing random quick matches. I can only assume that the first players to venture online were also the ones with the most experience with the original game. It was like everyone had been to a summer training camp apart from me. It was a little bit embarrassing, honestly. But I was never left gawking at the screen, wondering what the heck had just happened. They had more control, they were better at building up the ball’s momentum before launching it and they didn’t constantly jump around on an invisible pogo stick. It’s a terrible habit that I’ve never been able to shake. I think it will be a while before I fling myself into a ranked match, but I already feel like I’m making a lot of progress. The route to improvement is much more straightforward than in, say, Street Fighter V, and it’s mostly a matter of being able to decipher the ball’s movement and work on my timing. That’s easier said than done, but I’m keen! I would very much like to be good at hitting stuff. I get a great deal of joy just from a single well-timed, sturdy strike – what if they were all like that? It seems worth the effort. My screenshots absolutely don’t do justice to just how great it is to just watch. Blaze maintains all of the original’s style, but it upgrades everything else. The most noticeable change is the jump to 2.5D, but it’s the animation that sells the fights, giving them their incomparable speed and flow. 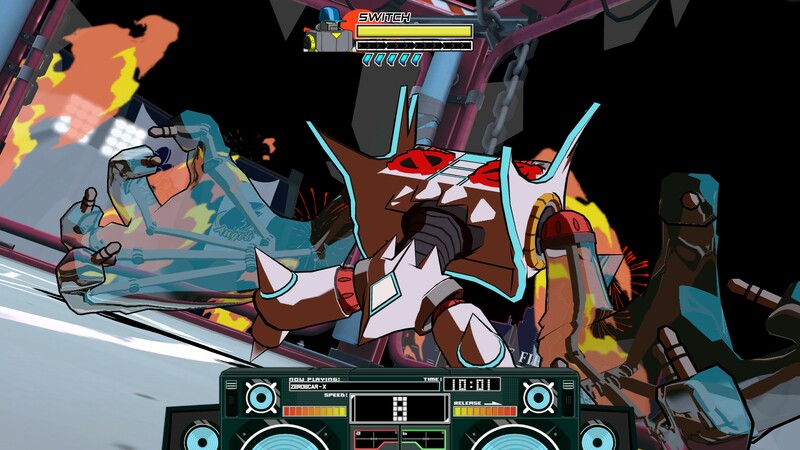 The influence of Jet Set Radio is even more apparent than it was in its predecessor, and that extends to the phenomenal soundtrack. I have played Blaze just to listen to it, and I will again. Jet Set Radio’s own Hideki Naganuma is in there, and Ain’t Nothin’ Like a Funky Beat is corker, but really the whole thing is a treat. 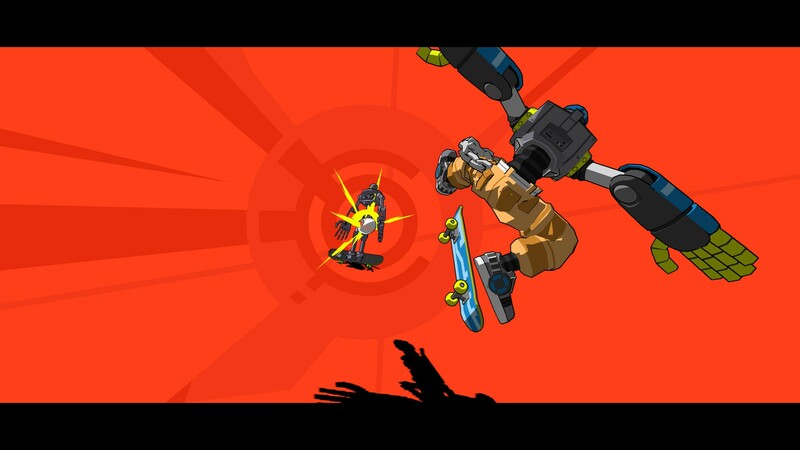 Lethal League Blaze doesn’t flip over the table, but it’s an extremely confident sequel that improves on just about every part of its predecessor. I think I’m going to be spending a lot of time with it. There are some flashy unlockable costumes hidden among the less interesting palette swaps, so I’m working on nabbing them at the moment, between more online beatings. What I’m really looking forward to, though, is getting it on the big TV and trapping a bunch of friends in my flat for the weekend. That’ll be the ultimate test, but I have very high hopes. Tagged with Bestest Bests, feature, Lethal League, review, RPS Recommended, Team Reptile, wot i think, Lethal League Blaze.